This weekend, all you old-house lovers will have two opportunities to step back in time and explore the elite Harlem enclave known as Strivers’ Row. 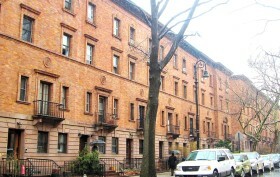 Located on West 138th to West 139th Streets, between Adam Clayton Powell and Frederick Douglass Boulevards, the area was once home to prominent, wealthy African-American performers, artists, and professionals who lived in the harmonious row of stately brick dwellings. Running until Sunday, October 5th is an exhibit at Macy’s called “Strivers’ Row Style: Uptown Comes Downtown,” which will feature vignettes by various designers of what the interiors of these historic homes would have looked like during the heyday. Also on the 5th is the Strivers’ Rome Home Tour, which lets participants inside eight of the distinctive residences and four historic churches.